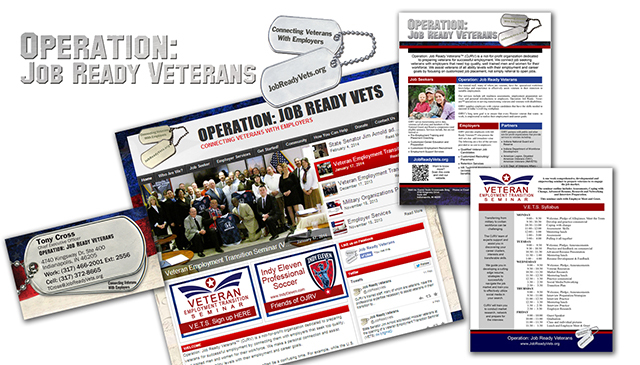 As a new start-up, Operation: Job Ready Veterans recognized a need to promote the efforts, activities, successes and partnerships of the organization, both internal and external. The Board of Directors needed a professional who was well-versed in a complete Marketing Strategy to include website design & development, graphic design, social media, media relations and event planning. McCormick-Dishman, LLC was contracted for planning, development and implementation of all of the organization’s marketing strategies, marketing communications and public relations activities, both external and internal. Phase I of the Integrated, Multi-Channel Marketing & Communications Plan: coordination of the organization’s brand, redevelopment of the existing website and implementation of a social media strategy. Along with these items, new marketing materials (for classes, presentations and promotion) and business cards were designed and printed.